If you're looking for a healthy banana pancake recipe that's vegan-friendly and super quick to prepare, here’s an easy guide to making banana pancakes from scratch with just two ingredients! This recipe is ideal if you want to enjoy the health benefits of banana and venture beyond your everyday banana smoothie. 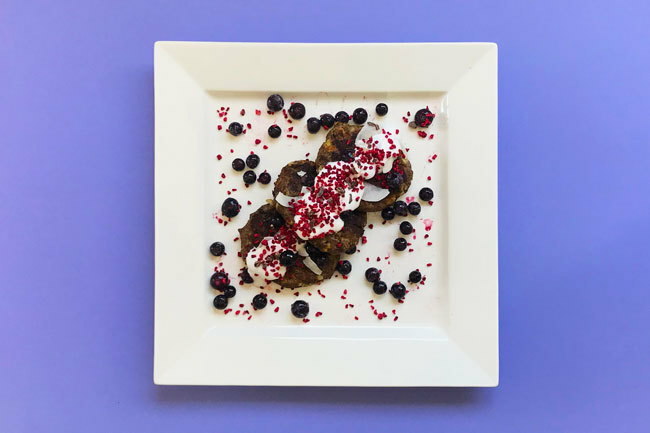 When I'm not having Craft Smoothie for breakfast, I like to make the vegan pancake recipe below as a cooked alternative to one of Craft Smoothie's superfood smoothie recipes. This usually happens on a Sunday morning when I have more time on my hands to try new healthy breakfast recipes. Forget pancake mixes, these are the best vegan pancakes because they’re so simple to prepare, are a good source of plant-based protein, and are a healthy alternative to conventional pancakes because they include no refined sugars. They’re also allergy-friendly with no gluten, no dairy, and no egg which means they’re suitable for vegans as well as those following gluten-free or paleo diets. What's The Secret To Making 2-Ingredient Banana Pancakes? Combining mashed banana with chia seeds is where the magic happens! We grind the chia seeds so they act as a binding powder that's rich in fibre and a host of other health benefits. Chia seeds are an awesome source of plant-based protein, essential fatty acids, and antioxidants, plus they're considered a beneficial food for babies so these recipes can be enjoyed by toddlers too. You can be as creative as you like in experimenting with different combinations of superfoods in your banana pancakes. A safe option is to add 1/2 teaspoon of cinnamon and 1/2 teaspoon of vanilla powder, or you could try adding 1 tablespoon of lucuma and/or 1 tablespoon of mesquite for a salted caramel-like flavour. Each recipe serves one person. To make these banana pancakes for two, just double the recipe. If you don't have any chia seeds in the pantry, you can directly substitute ground linseed (or flaxseed) for the ground chia seeds because linseed also has a binding effect when combined with mashed banana. Linseed also contains a good source of omega-3 fatty acids, fibre, and a host of essential vitamins and minerals. If you want to make banana pancakes with no flour but want to include some added fibre, adding oats (or even granola) is an easy way to up the fibre content of your breakfast and help sustain your energy levels. Just add a couple of tablespoons of oats to your banana pancake mixture. If you’re following a gluten-free or low carb-diet, using almond flour or coconut flour as an alternative to oats can help bulk up the nutrient density of your pancakes. You could also add chopped almonds or coconut flakes to the mixture or as toppings. This recipe is tasty proof that banana pancakes can be part of a well-balanced breakfast. Bananas are an awesome source of dietary fibre, potassium, and disease-fighting antioxidants. They also have benefits for digestion, heart health, and weight loss. By combining banana with chia seeds, you can easily create a nourishing plant-based breakfast that provides all the nutrients you need for a healthy start to your day. If you don't have time to make banana pancakes in the morning but want to enjoy the benefits of a healthy wholefood breakfast that incorporates the health benefits of fresh ingredients like banana and superfoods like chia seeds, try a Craft Smoothie box and get everything you need to make superfood smoothies - delivered to your door.